Article the first. …. After the first enumeration required by the first article of the Constitution, there shall be one Representative for every 30,000 until the number shall amount to 100, after which the proportion shall be so regulated by Congress, that there shall be not less than 100 Representatives, nor less than one Representative for every 40,000 persons, until the number of Representatives shall amount to 200; after which the proportion shall be so regulated by Congress, that there shall not be less than 200 Representatives, nor more than one Representative for every 50,000 persons. Article the second … No law, varying the compensation for the services of the Senators and Representatives, shall take effect, until an election of Representatives shall have intervened. Article the third …… Congress shall make no law respecting an establishment of religion, or prohibiting the free exercise thereof; or abridging the freedom of speech, or of the press; or the right of the people peaceably to assemble, and to petition the Government for a redress of grievances. Article the fourth….. A well regulated Militia, being necessary to the security of a free state, the right of the people to keep and bear arms, shall not be infringed. Article the fifth ……. No soldier shall, in time of peace be quartered in any house, without the consent of the owner, nor in time of war, but in a manner to be prescribed by law. Article the sixth …… The right of the people to be secure in their persons, houses, papers, and effects, against unreasonable searches and seizures, shall not be violated, and no Warrants shall issue, but upon probable cause, supported by Oath or affirmation, and particularly describing the place to be searched, and the persons or things to be seized. Article the eighth … In all criminal prosecutions, the accused shall enjoy the right to a speedy and public trial, by an impartial jury of the State and district wherein the crime shall have been committed, which district shall have been previously ascertained by law, and to be informed of the nature and cause of the accusation; to be confronted with the witnesses against him; to have compulsory process for obtaining witnesses in his favor, and to have the Assistance of Counsel for his defense. Article the tenth ….. Excessive bail shall not be required, nor excessive fines imposed, nor cruel and unusual punishments inflicted. Article the eleventh …. The enumeration in the Constitution, of certain rights, shall not be construed to deny or disparage others retained by the people. 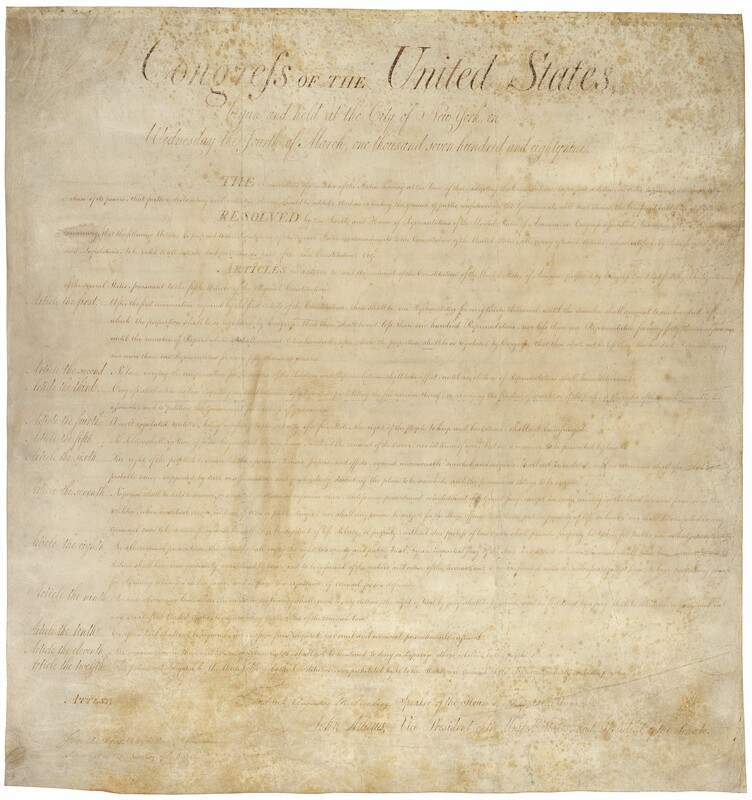 Below is a high resolution image of the Bill of Rights. Click the image for a larger view. When it opens in a new windows, you may need to zoom or click again for a larger view.